Click the "multiple solar stoves" tab to your left now, to watch this short one minute video. So, you CAN cook your favorite comfort foods outside using just sunshine. Click on any of our solar oven recipes tabs to see some being prepared. With some solar stoves, you can even prepare your favorite slow cooker meals outside without electricity. Set these cookers up beforehand and your food will cook while you are out playing. It'll be ready to eat when you get back. Just like in a crockpot at home that has been plugged into the wall! Imagine coming back to camp, grabbing a cold one from the ice chest and then sitting back to enjoy it with some already hot, cheesy bean dip and chips. I suppose that you could skip the appetizer and go straight to your main course that is ready to eat. It's up to you how you want your evening camp to unfold! ... or have an elegant CHOCOLATE FONDUE going beside you while you putter around in your strawberry patch. Serve up hot NACHOS with REFRIED BEANS and MELTED CHEESE when you're tailgating and waiting for that killer outdoor summer concert to start. Quickly set up a pot of APPLES WITH YAMS, or a STRAWBERRY/RHUBARB COBBLER out in the sun to solar slow cook when you visit your local U-Pick Fruit Farm. It'll be ready to sample when you're ready for a break. STEAM YOUR CLAMS on the spot, at the beach. BAKE those two RAINBOW TROUT 'til they're hot and flakey on the bank behind you. Your trout will be ready to devour in about a half hour. You won't have to wait until you get home to sample that fresh, WILD ASPARAGUS that you rescued from the side of the road. Cook it and have a picnic nearby. KEEP YOUR RV COOL in the summer. Cook the smart way... outside! Play cards or take a nap in the meantime. What is your favorite slow cooker recipe ? OUTSIDE STREET FAIR VENDORS use solar slow cooking not only to cook their meals, They USE IT TO GAIN ATTENTION. Succulent cooking aromas at an outdoor art fair or a flea market are powerful people stoppers! HOME SCHOOLERS eagerly combine studying science with improving their culinary skills practicing solar cooking. Bribe 'em to learn with food! What is your favorite slow cooker recipe for kids? Gain the ability to STERILIZE STANDING WATER with solar slow cooking. This need after hurricanes, earthquakes, floods or whenever the electricity goes out is VITAL.! Hang on, there's a video on the "how does it work" page. The link is below. But there is more! So, if any of this sounds intriguing, please take the time to explore some of the solar cooker links below. Realize that I got a little silly in a couple of places! How does a solar slow cooker work ? how does a solar slow cooker work explained. Order solar slow cooker to enjoy your favorite slow cooker recipes outside ! Mix sunshine and chocolate in these solar oven recipes for chocolate fondue. Think fondue in your berry patch! Solar oven recipes for fifteen minute nachos. Chow down anywhere the sun shines! Where in the world do they solar cook? Multiple Solar Cooker can be handy fixing multiple course feasts. Simple solar oven recipes for vegetarian with spinach, onion, red or green peppers, lemon and tofu. Solar oven recipes for rice are surprisingly popular worldwide. View the video here. 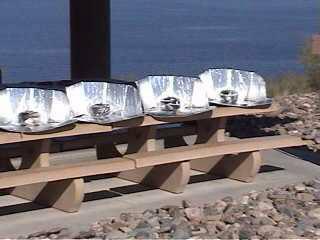 View this solar cooker recipe for traditional steamed clams. Prepare them anywhere under the sun you'd like to eat them!